Just because you beat the Elite Four and become the champion of Hoenn doesn't mean Pokémon Omega Ruby and Alpha Sapphire has nothing more to offer. If you keep playing after you beat the game, you'll have a chance to experience something wild. If you don't want to be spoiled on the post-game in ORAS, you should stop reading now! Now that that's out of the way, let's talk about the Delta Episode, which is a chunk of story in Omega Ruby and Alpha Sapphire that opens up once you beat the main game. Perhaps you've heard of the Delta Episode before. It was marketed as the means through which players would have a chance to catch Deoxys, a particularly rare legendary Pokémon. 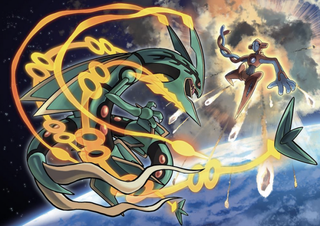 Truthfully, I didn't care much about capturing Deoxys—I'm in legendary Pokémon fatigue, especially given that Omega Ruby and Alpha Sapphire contain more legendaries than any game before them. Still, I'm glad that I played it, because it's the best part of the game. Here's the premise: Hoenn's space center has detected a giant asteroid coming straight at them. You happen to be attending an event at the space center, so, naturally, you get caught up with everything going on there. I won't spoil what happens in its entirety, because you should play it, but I wanted to bring attention to something one of the characters says. You can watch the scene here, if you'd like—sorry for the mild shaky cam! Basically, the space center people propose fixing the problem by warping the asteroid elsewhere—anywhere, really. They don't care where it goes, so long as it doesn't destroy Hoenn. But then a mysterious woman appears, and she reveals that the portal would send the asteroid to a different version of Hoenn, where mega evolution—the process which allows Pokémon to transform and gain a temporary power-up—never happened. She also mentions that the energy necessary to fuel the technology that would warp the asteroid is the same used to fuel a war that happened three thousand years before the events of Pokémon Omega Ruby and Alpha Sapphire. What this means is,there are multiple timelines in the world of Pokémon. One where Mega Evolution never happened, and one where it does. This would explain how they're able to add Mega Evolutions in remakes of games that didn't have them before—the remakes and the original games aren't even the same world. It's kind of ridiculous, but I love it—and I'm ready to see players try to stitch timelines together. The other interesting thing about this is what she says about the energy weapon. If you've played X & Y, you know that the story there deals with the King of Kalos, a man who built a weapon that ended a war three thousand years ago. Except the weapon was powered by the life force of Pokémon, so while ending the war was a good thing, the cost was pretty high. The fact that both X & Y and ORAS have mega evolutions is probably enough to solidify the idea they're in the same timeline, but the reference to that ultra weapon in ORAS is extra evidence. These plot developments also suggest that the scientists in this version of Hoenn are fucked up. Then again, I suppose killing a few Pokémon is a small sacrifice for a greater good. Maybe I shouldn't be horrified—we know that people eat Pokémon, we know that Pokémon die, and we know that Pokémon have been used in genetic experiments. Harvesting Pokémon is not particularly shocking in a world that does all those things, but for whatever reason, we like to dismiss Pokémon's story, and we like to maintain that it's just happy-go-lucky fun. Actually, it's a bit dark, no? This is why I like the Delta Episode so much. Sure, it's a chance to capture some powerful Pokémon. But it's also not afraid to throw some curveballs about Pokémon's story. It's shockingly mature for a Pokémon game. Hell, even smaller moments—like the entire reason you get the space center tickets—are kind of heavy. The series developers at Game Freak kept the main story more or less the same as the original games, and that makes sense, because ORAS are remakes. But it's in the post-game where we see the more modern Game Freak, and it's wonderful. All of this to say: you should play the Delta Episode, because it's the best thing in Pokémon Omega Ruby and Alpha Sapphire. Other characters mention the Battle Frontier project, too. Now, it could be just a cheeky reference. But I'm still suspicious. Could the Battle Frontier be something that Game Freak releases in the future, as DLC or something? Or perhaps in whatever game gets made next? Hard to say, but I'll keep you updated if I ever find out. For now, take solace in the fact that you still have the Delta Episode, which is pretty damn good. P.S. once you play through the Delta Episode, take a look at this wild theory—which talks about the implications put forth in the Delta Episode about how Mega Stones were made, and about Deoxys itself.